Almonds, which are lower in saturated fat than many other nuts, also contain fiber, vitamin E and protein. It is important to harvest your almonds at the right time. If you harvest too early, they will not be ripe enough. If you harvest too late, birds may steal the nuts and insects may infest them. After harvesting, you must hull the almonds and dry them completely for storage. Dried almonds will keep for up to eight months at room temperature, according to the University of California. Harvest your almonds when most of the hulls have split open slightly. According to the University of California Cooperative Extension, almonds will first ripen at the crown of the tree and then progress downward. The beginning of August to the end of September is the peak harvesting time. Spread a clean tarp underneath the almond tree. Knock the branches with a long, sturdy pole. It may be easier to firmly shake lower branches with your hands. Collect the fallen nuts into a basket as soon as you have dislodged them. Gathering them up quickly helps prevent damage from ants. Insert your fingers into the split in the hulls and remove them. Spread the hulled almonds on trays and cover them with a screen to prevent birds from carrying them off. Place the trays outdoors to allow the almonds to dry. Check the almonds for dryness every day. 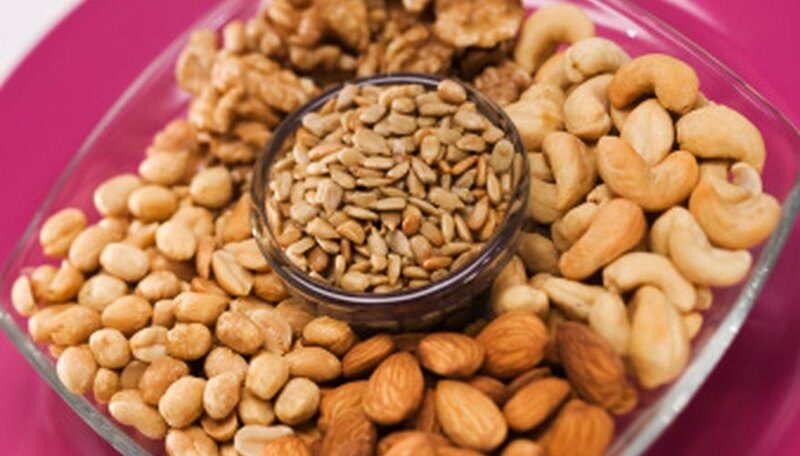 Select several different almonds from various trays and crack open the shells. Remove the kernels and break them. If the kernels are brittle when broken, the almonds are dry. If the kernels feel rubbery, the almonds need more drying time. Store the almonds in airtight containers. The University of California recommends storing them away from pungent items like garlic and onions, as they can absorb odors. You may shell them before storage if you wish, but this is not necessary. If it begins to rain, move the almond trays indoors. The University of California recommends that you wear safety goggles and protective head gear, such as a hard hat, when shaking almonds off of trees. They may strike you.